This type of ship is equipped with phaser cannons in the foremost tips, but no serious threat to a Federation Galaxy class. 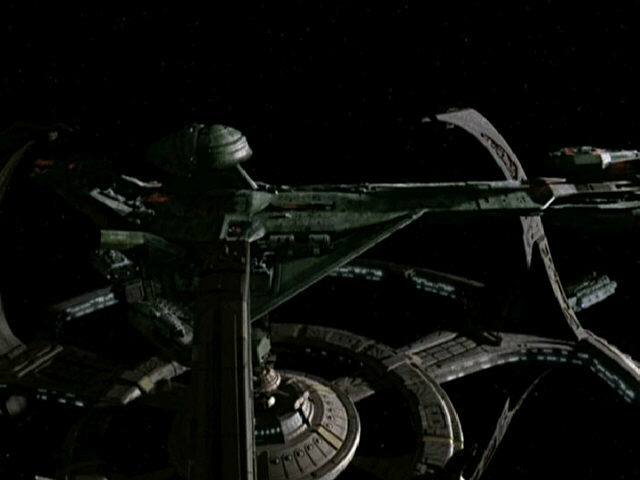 Baran's ship is identical to the Miradorn Theta-class fighter from DS9: "Vortex". It is well possible that the two vessels are actually the same design. This mighty warship is equipped with an extendable saw to cut through another ship's hull. Its shields are impervious to spatial torpedoes. The aliens remained unnamed and unseen in the episode. The immortal Flint is in possession of a shuttle or small ship that can be launched from the top of one of the towers of his castle on Holberg 917-G. 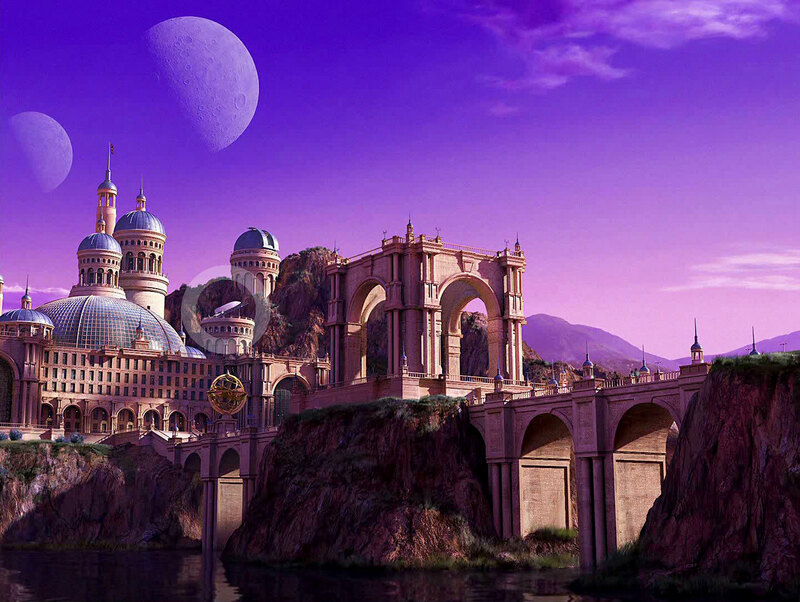 The shuttle is visible on the revised matte painting of the planet Holberg 917-G (previously just a reuse of the castle from "The Cage"). The ramp may be a homage to science fiction movies of the 1950s, where such a launch method was commonplace (well, and to the NX prototypes). Scenic artist Max Gabl, who worked on TOS-R, confirms the existence of the shuttle: "The model of the building and the shuttle was one of the 3D models supplied by [visual effects supervisor] Niel Wray." Captain Fraddock's small transport vessel may accommodate at least ten passengers. A small shuttle belongs to Kago-Darr, a bounty hunter. This may be a new design. Lazarus's shuttle is a small craft with only one seat and unknown capabilities. Lazarus says that he comes from the very planet where the Enterprise encountered him, but also that he is a time traveler. So it may be a timeship, although we shouldn't lend anything that Lazarus says too much credence. It is not certain either whether the shuttle is equipped with warp propulsion. We wouldn't expect such a small craft to be warp-capable, but there is a dilithium chamber in the forward wall that would provide the required power. 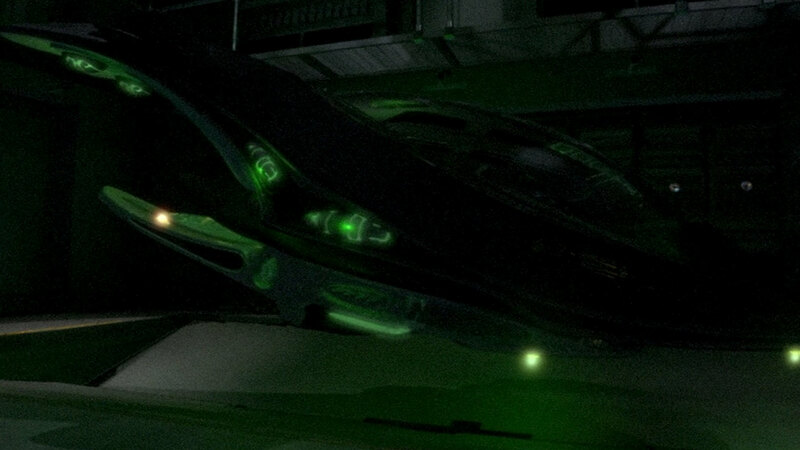 The probe Nomad was developed by Jackson Roykirk and launched in 2002, to seek out alien life. It later collided with an alien probe named Tan Ru, thereby forming a new, enormously powerful device. Nomad appeared in TOS: "The Changeling". Nomad's appearance after the collision, as depicted above, has very few, if anything, in common with the original configuration. Aside from that, it is of course woefully unlikely that two probes with incompatible technologies could merge to one and that this new probe could even emerge to such a powerful device. This type of pirate vessel is quite small, lightly armed, and it exceeds the top speed of a J-class freighter. Two ships of this type attacked the ECS Horizon and planted a beacon on the freighter's starboard nacelle (ENT: "Horizon"). The diagram of the vessel could be seen in a transmission from the Constellation, obviously another freighter that had been attacked. The design is the same as the Ankari vessel from VOY: "Equinox". But it appears that the whole design has been flattened, as indicated by the engine exhausts, which were round on the Ankari vessel and are now flat ellipses. 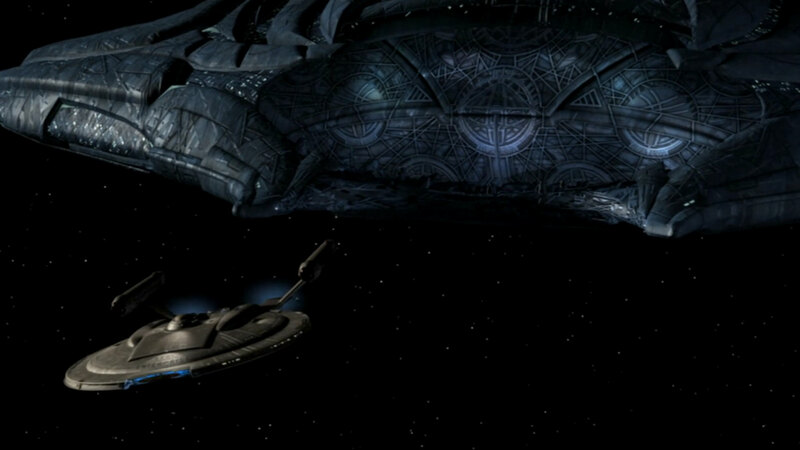 Considering that the design incorporates stylistic elements of the Akritirian patrol ship, it was only logical to re-use these two vessels, if any, as pirate ships in the ENT episode. There are no specs about the pirate vessel, except that it seems to be equipped with plasma cannons. 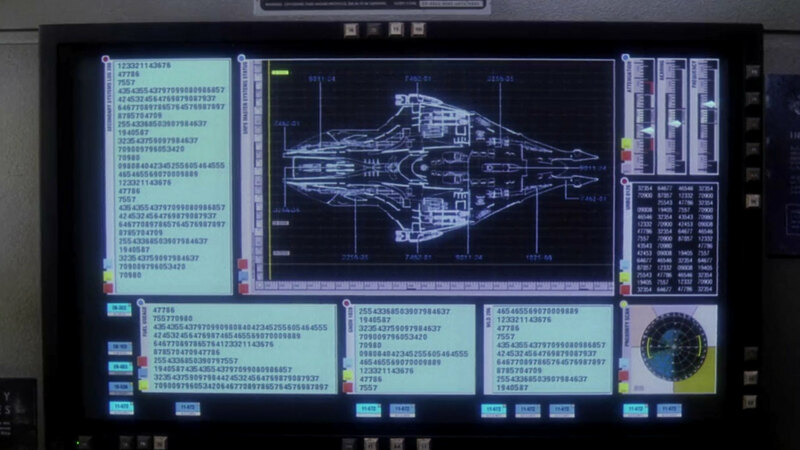 This second type of pirate ships from ENT: "Horizon" is obviously larger and stronger than the first one and uses technology similar as that of the Mazarites according to Mayweather. It is a re-use of the Akritirian ship from VOY: "The Chute". 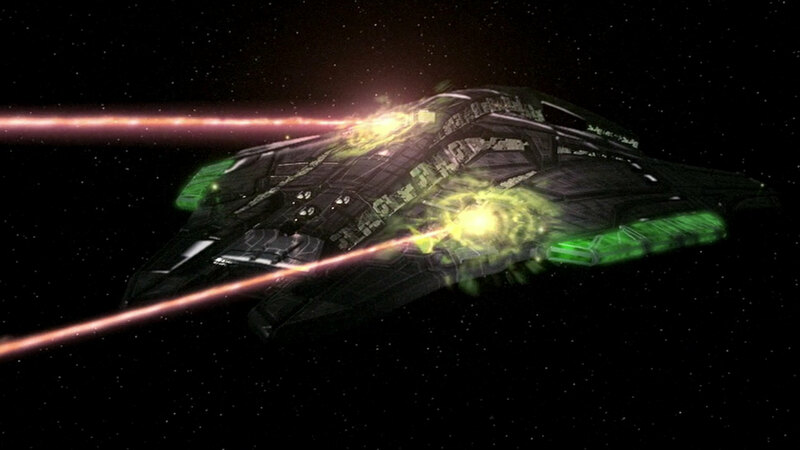 The CGI model had exceeded its useful life span already in the Delta Quadrant, but has lately appeared also as the Kriosian battlecruiser. There are a few modifications on the pirate ship that are not on the other versions though. This small shuttle is manned with a crew of at least two. The non-humanoid aliens remained unnamed in the episode. The alien warship is relatively large, outguns a Starfleet NX class and is impervious to most 22nd century Starfleet weapons. This ship is heavily armed and would be capable of taking on a Galaxy-class ship, if its defense systems did not fail. 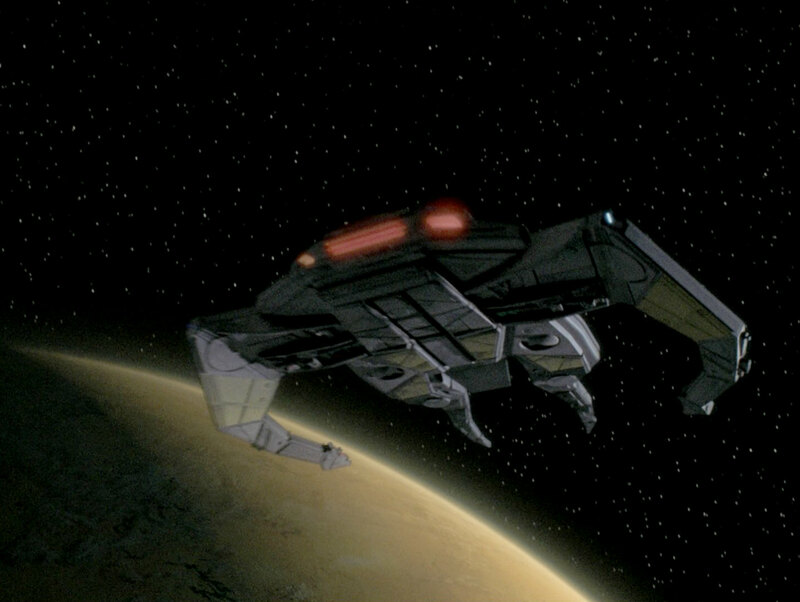 The smuggler ship was seen in TNG: "Unification". 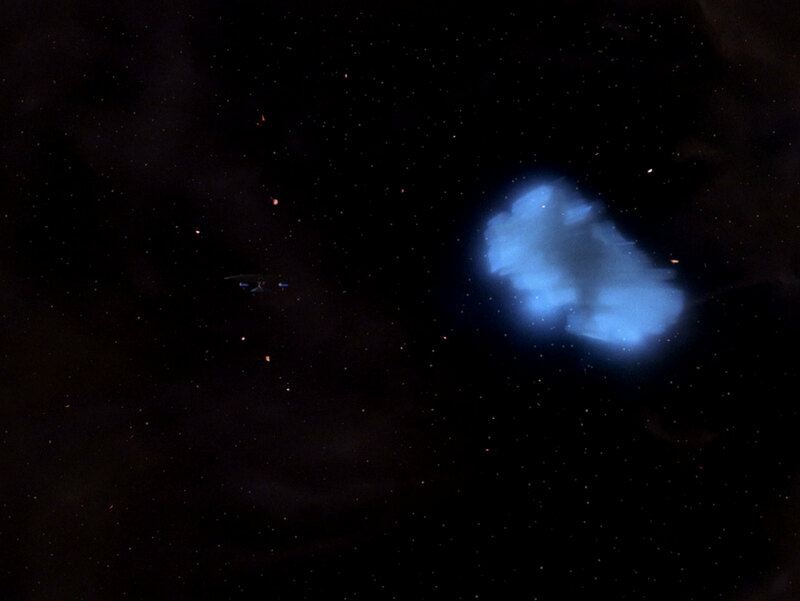 It exploded after the first hit from the Enterprise's phasers, when its shield systems overloaded. The miniature seems to be a redress of Kivas Fajo's Jovis. It was subsequently modified to the Bajoran freighter 2. This is a small warp-capable vessel with otherwise unknown capabilities. Curiously, the ship design appeared twice, and in both cases it was used by terrorists (by the group who attempted to steal the trilithium in TNG: "Starship Mine", as well as the Ekina of Verad's gang in DS9: "Invasive Procedures"). 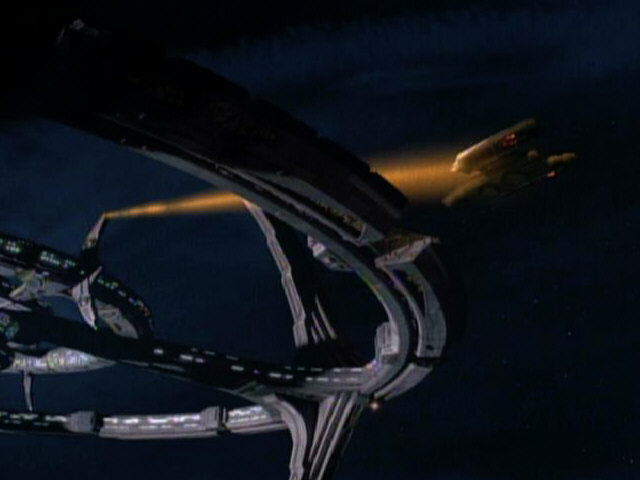 The terrorist ship is a re-use of the Lysian sentry pod from TNG: "Conundrum". The two designs should have nothing in common, considering that the Lysian pod was unmanned and on a low technological level. For what it's worth, the terrorist ship was shown "upside down" on both occasions. While there is a bluish engine glow on the ship in TNG (obviously representing a warp drive), the DS9 version has a red light on the nacelle underside. Just before the end credits we can see the stock footage of the Skrreean vessels from DS9: "Sanctuary", which already appeared in "Sons of Mogh" earlier in the fourth season. The most notable ship is the unknown Klingon type, the former Promellian battlecruiser. 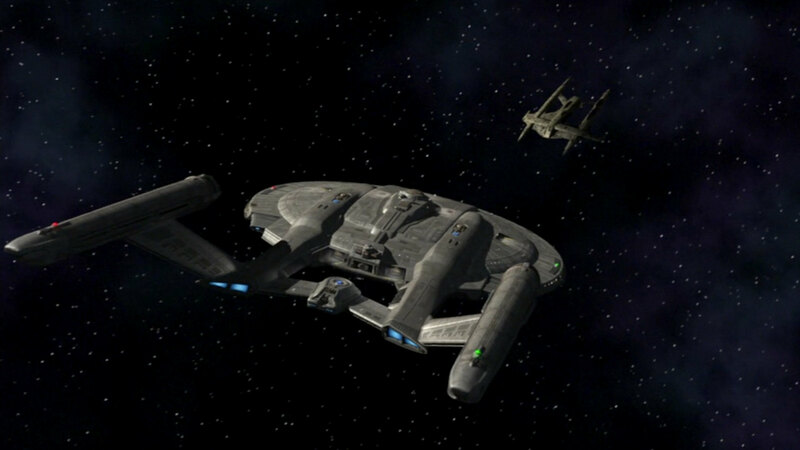 While we may neglect the possibility that the Skrreeans have returned with a lot of vessels, the idea that it is a Klingon ship is not quite fitting either, knowing that the relations with the Klingons hit rock bottom at the end of the fourth season. Hence, the ship's origin remains uncertain. Nothing except for the probe's original purpose is known. The affiliation of this ship type listed in a Starfleet database is unknown. The image appeared upside-down on a computer screen in some TNG episodes. It was taken from a FASA manual, there identified as "Orion Wanderer Class V Blockade Runner". It may as well be a Federation ship or a design by any other race, there is no clue. Nothing is known about this vessel, except that it may be operated by a telepathic race. The ship could be seen very briefly as an almost shapeless light effect. A small depiction in the Star Trek Fact Files shows a rather angular compact vessel. While it is still possible that a crude model is hidden inside the light, we can't really recognize it. In order to illustrate the Tyken's rift incident, it may have been decided to use a generic shape for the vessel in the Fact Files. The affiliation of this ship is unknown. 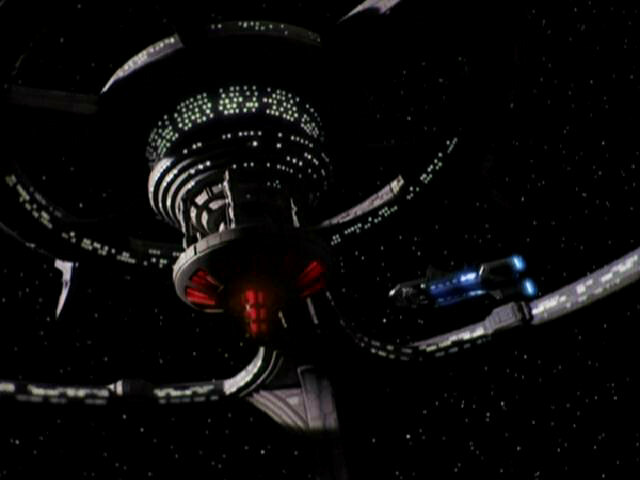 The ship could be seen in the DS9 opening credits since the fourth season, and in stock footage a number of subsequent episodes. It doesn't look like a design that was identified anywhere else. The affiliation of this shuttle is unknown. The shuttle appears on the roof of the station on Rigel X. It has a triangular planform and green nacelles. 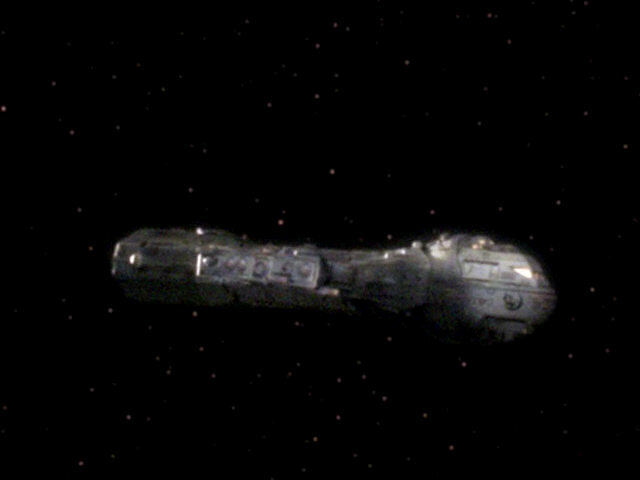 It is obviously a slight modification of Qatai's ship from VOY: "Bliss", with only the lighting being somewhat different. Note that in the total view of the roof the landed shuttle I (upper right corner) looks almost like a Tholian vessel, but the triangular piece above the main body is the edge of the landing platform! The shuttle on the lower right is the Wysanti vessel from VOY: "Imperfection". The shuttle on the bottom and the one leaving the scene on the upper right is the Dralian vessel from VOY: "Critical Care". 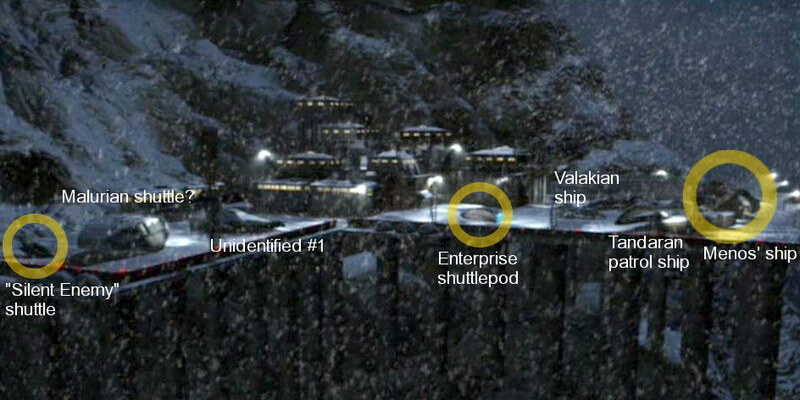 With the exception of the Enterprise shuttlepod and Menos's ship all other vessels seem to leave the landing platform after a fire has broken out in the bar. 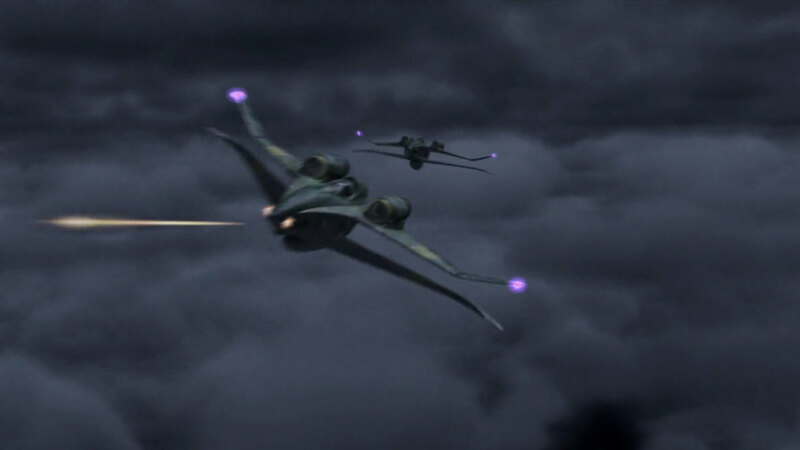 We can recognize: the "Silent Enemy" shuttle with its characteristic rounded shapes, possibly the the boxy Malurian shuttle, the asymmetric Tandaran patrol ship, the Nausicaan fighter and the Axanar rescue vessel. The affiliation of this transport ship is unknown. This is the ship that sent a distress call after a reactor accident. Only one passenger was known to be Antaran, the other races and the affiliation of the ship remain unknown. 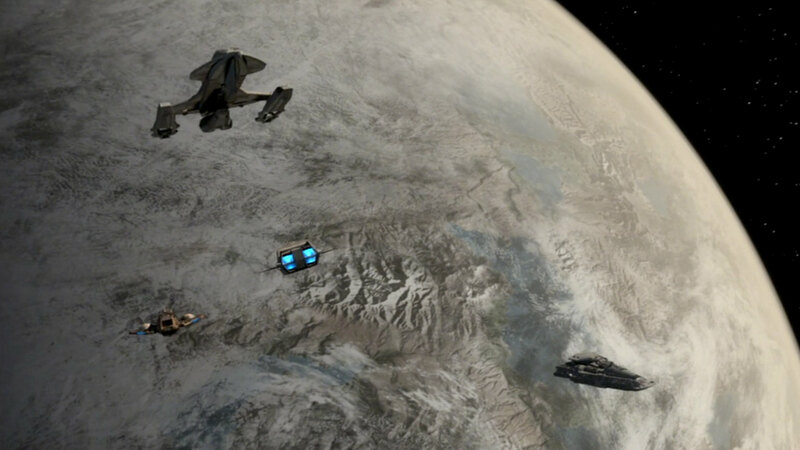 Various ships, seen leaving the planet Xantoras in ENT: "The Breach"
The Xantoran government ordered all offworlders to leave the planet. 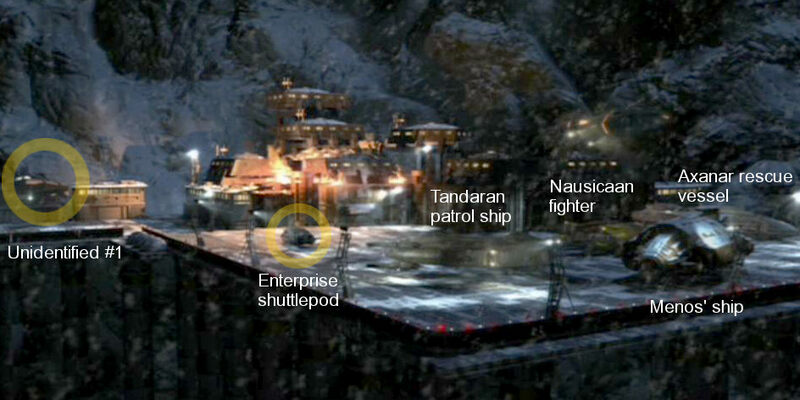 Therefore most likely none of these ships is Xantoran. We can identify: The Karemma/Bajoran ship (upper left), Qatai's ship (lower left) and the ubiquitous "hammerhead" freighter (lower right). 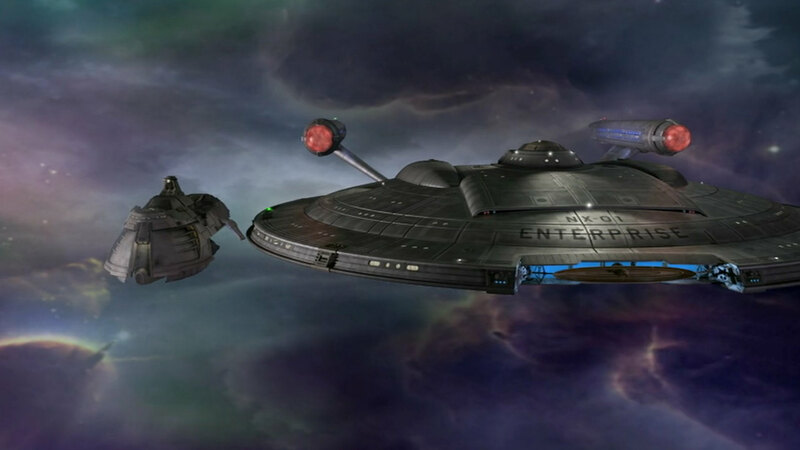 The two first obviously can't be the designs we are seeing, while it would be no problem if the latter were the same class as Ezral's ship (see Kantare). The affiliation of this space station is uncertain. It may be Tellarite. The CGI of the station is clearly the same as of the Monac shipyards or Cardassian repair station. Its three long outward docking struts, which were not part of the Cardassian repair station, were retained from the shipyards (five struts). Since the Cardassian stations fit well into their culture's design lineage, the unknown station from Enterprise should be a different design. Unless it is actually Cardassian - there would be no reason against this assumption, although it was most definitely not supposed to be Cardassian but rather Tellarite. 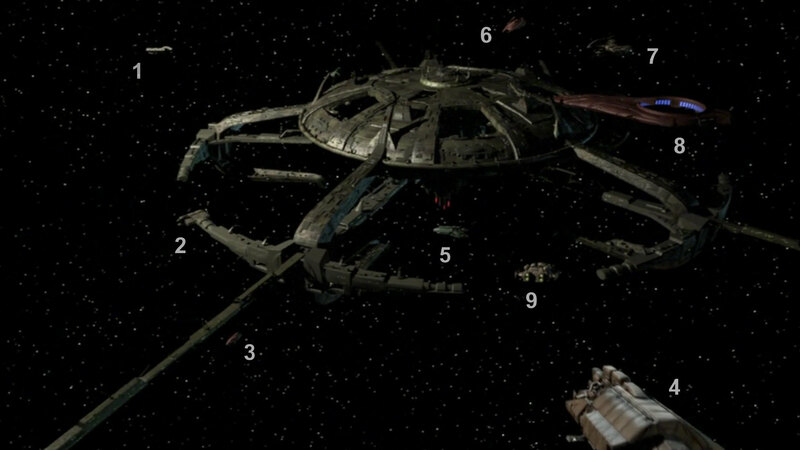 Various ships, seen at the station in ENT: "Bounty"
Some of these vessels are identifiable: Retellian freighters (1&2), Menos's ship (4, with brownish color and without Klingon-style nacelles), Klingon "rebel" transport (5, the same in green with nacelles), Vulcan Vahklas (6), Tandaran patrol ship (7), Vulcan D'Kyr (8, with the inner ring in horizontal position), Tellarite shuttle (9). 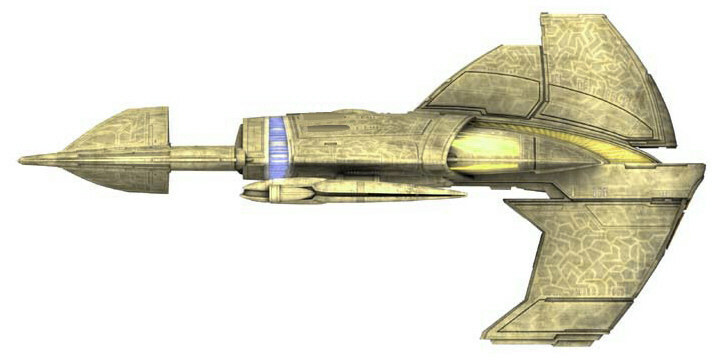 The vessel #3 may be the support craft of the Vulcan ship, as it is missing from inside the engine ring of the D'Kyr type. This ship, possibly a freighter, consists of a main hull that flattens out to a saucer, with two nacelles attached to its ends. The ship was raided by the Osaarians, its crew killed by them. 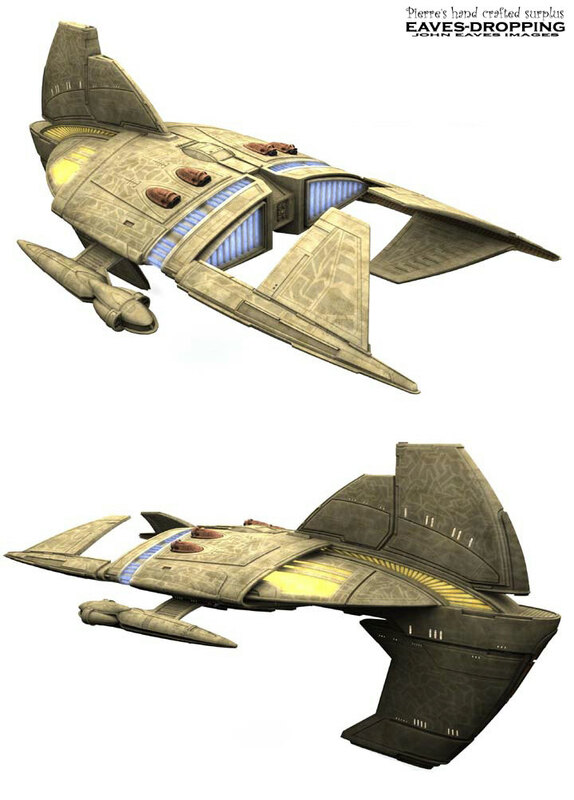 This type of ship with a crab-like planform, engine pods and a vertical fin at the forward end is warp-capable and moderately armed. 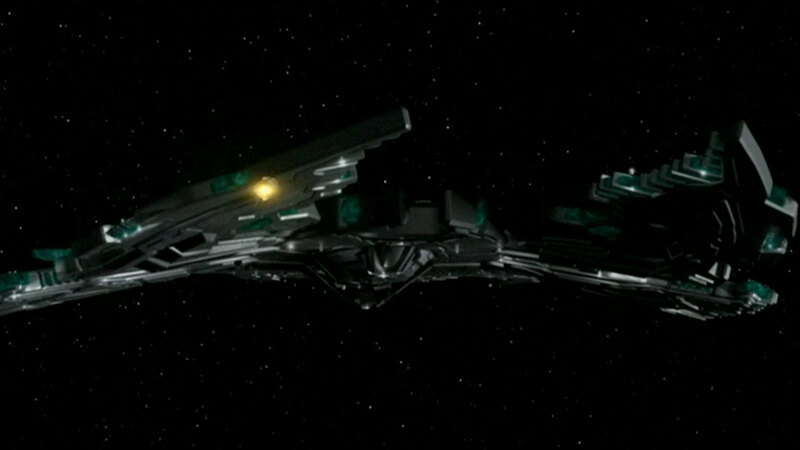 Two ships of this type appeared in the episode. They seemed to be somewhat smaller than Enterprise. The original design by John Eaves included four small shuttles that were embedded into the hull, just in front of the blue engine ring. Pierre Drolet modeled the ship accordingly, but the shuttles are not present in the episode as it aired. Our gallery shows the ship with those shuttles. This small ship is believed to be a science vessel and is equipped with low-yield beam weapons only. 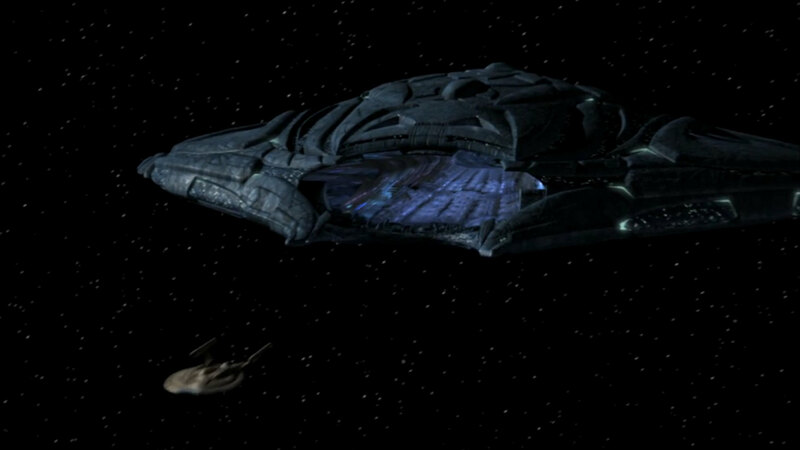 Although classified by T'Pol in ENT: "Bound" as a vessel of "unknown configuration", it is clearly a re-use of the Nausicaan raider. This jet fighter aircraft, a biplane with two engines, controls the skies above one of the nation states of the planet. The aliens remained unnamed in the episode. 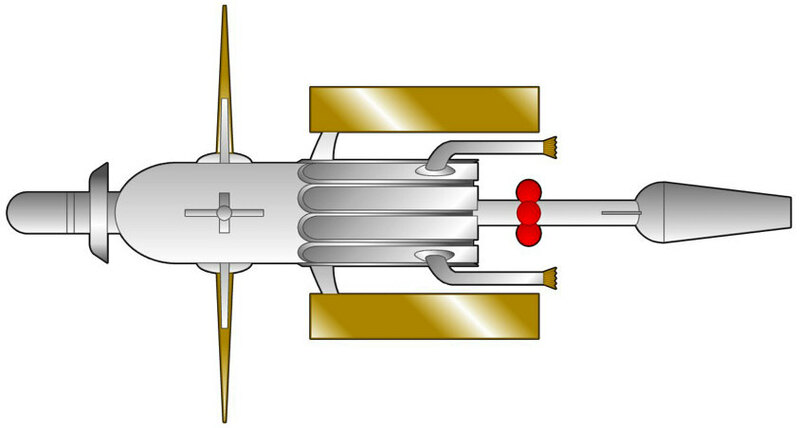 John Eaves laid out this design as an extrapolation of a German Messerschmitt Me 262 aircraft. This is a small and lightly armed or unarmed transport vessel. Ambassador Ves Alkar was aboard this vessel called Dorian. There is no clue if it was sent from Rekag-Seronia, where he was supposed to negotiate, or from his people, the Lumerians. The ship is stock footage of the Angosian transport vessel. The only problem is that the Angosian version was not warp-capable, whereas the Dorian was encountered in interstellar space. 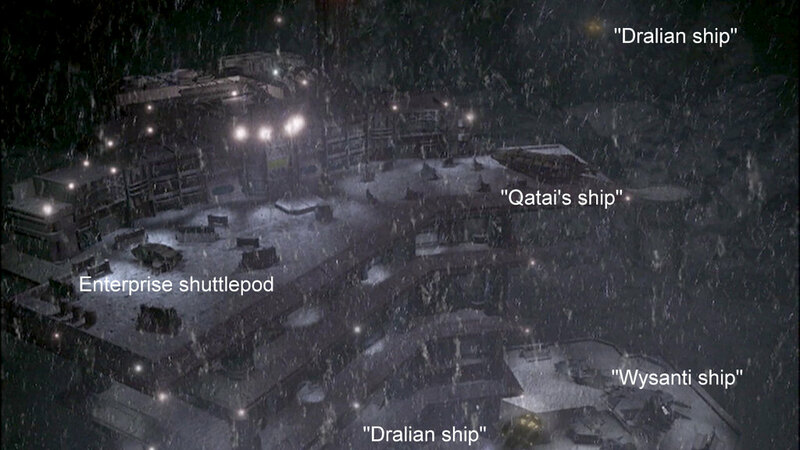 The huge alien vessel is equipped with a large gate to "swallow" other ships. Its hull is impervious to Enterprise's sensors. The ship was analyzed to be "more than 500m across", but the gate alone that occupied barely a fourth of its width was already more than 600m wide. The measurements with the orthographic views give us a width of as much as 3800m and a length of 4300m. Why do non-corporeal beings from subspace need a starship? Also, what was the big hatch useful for? As T'Pol explained, they only needed to transfer themselves to humanoid hosts because their ship was deteriorating. So what would they normally do with that hatch?